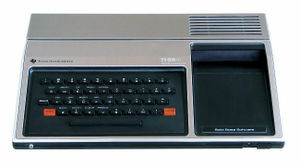 The TI-99/4 was the predecessor of the TI-99/4A home computer. 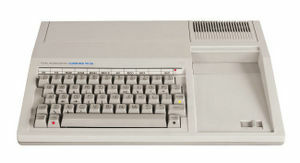 The TI-99/4A console is available in two flavors: the traditional silver/black case, and the beige case. 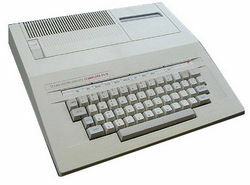 The beige case replaced the former one as a reaction to lowering production costs, and the upcoming spreading of home computer equipment of various manufacturers, using that color. All cartridges manufactured in the year 1983 have a beige case, matching the beige console, while the earlier cartridges had a black case. The Mechatronics Mouse was attached to a box which connected to the Joystick port. The Joystick port is located on the left side of the console and is a 9 pin male socket. The concept of the mouse adapter is pretty interesting: Although the joystick port offers only few input lines, it is possible to receive mouse movements with different speeds. 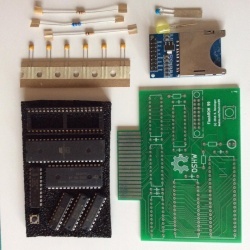 The solution is to use a counter chip in the adapter which may be queried by four input lines, providing direction information and at most 7 steps in each direction for one axis. The mouse adaptor switches between x and y axis after each query. Each query decrements the axis counter by the step count being read until it is zero. 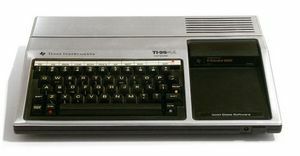 In earlier versions, the TI-99/4 and its successor, the TI-99/4A, allowed to attach devices at the right side of the console, one next to each other. This attachment of devices was commonly known as the sidecar expansion. This chain of devices proved to cause instabilities, and from a practical point of view, it just required a lot of space on the table. Therefore, TI introduced the Peripheral Expansion Box (PEB) with an own power supply and slots for up to eight expansion cards. The Navarone Cartridge Expander is a simple way to expand the cartridge slot. It must be plugged into the cartridge slot and can host up to three cartridges. However, only one cartridge can be active at a time, and the cartridges must be manually selected with a switch. There is also a reset button which allows to trigger a reset signal when switching between cartridges (which would normally be triggered by inserting the cartridge). While the cartridge expander reduces wear on the cartridge slot, it is subject to wear on itself, especially on the plastic switch, making it increasingly difficult to safely select a cartridge. Moreover, when the system is running, switching may cause spikes on the bus, which often leads to lock-ups. A safer way to switch cartridges would be to utilize the build-in module library feature, but while originally designed and implemented by TI, it has not been used in any known device from TI or from third parties. The GRAM Kracker is device sold by Miller Graphics that plugs into the cartridge port on your console. The device allows you to dump cartridges to diskette and then load those files into the Gram Kracker. This allows you to run the cartridge without physically using it. Because it is in memory it also allows you to change/modify if you want to. 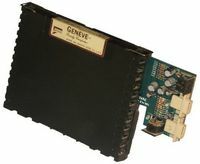 In contrast to the other systems, the Geneve does not offer a separate console. The complete system is built on a single PCB, designed as a peripheral expansion card which plugs into the Peripheral Expansion Box. The TI-99/4, TI-99/4A, and Geneve share a common expansion concept, the Peripheral Expansion System. 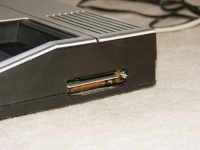 The Peripheral Expansion Box (PEB) offers space for up to seven expansion cards, plus a connector card in one slot (for the Geneve system, this card is replaced by the Geneve card). This interesting expansion card was never produced in quantity. Sven Dyroff developed it just to see if it was possible to interface a light gun designed for an Atari 2600 with a TI-99/4A. His prototype worked, but no additional cards were ever produced. The Myarc HFDC (Hard and Floppy Disk Controller) was the first card to support harddisks on the TI-99/4A and the Geneve. At this time, IDE or SCSI drives were not known or not easy to get, so only the so-called MFM harddrives. 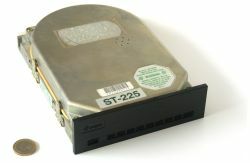 One of the common harddrives of that time was the Seagate ST-225 with 20 MiB capacity. This page was last modified on 30 April 2018, at 20:11.